OpenScad is one of those tools that opens your mind. It falls into the category of mechanical description languages. Instead of the typical Graphical User Interface (GUI) for designing parts, OpenScad generates the parts from the code typed by the user. This way, the mechanical parts are now pieces of code that can be easily documented, shared among users, uploaded into repositories and so forth. One of the advantages of this approach is that the code can also be generated by other programs, opening the doors to future design tools that can create physical models from high level specifications. Imagine a software tool able to create robots from the user requests: “I want a mobile robot with tracks, a size lower that xxxx …”. The tool will be in charge of calculating everything and finally offering the user the prototypes that best fit its needs. These tools will also be able to use evolutionary algorithms to build optimized robots or parts. For programming such tools, we need to combine the power of a standard programming language with the ability to create physical parts. That is one of the goal of the Object Oriented Mechanical Library (OOML): applying the object oriented paradigm for designing parts (in C++). 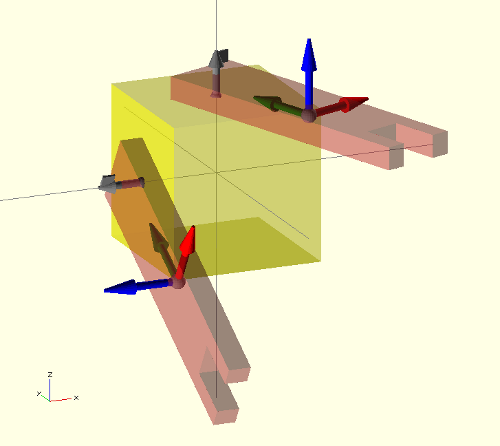 It is a research project for developing new paradigm for designing mechanics. 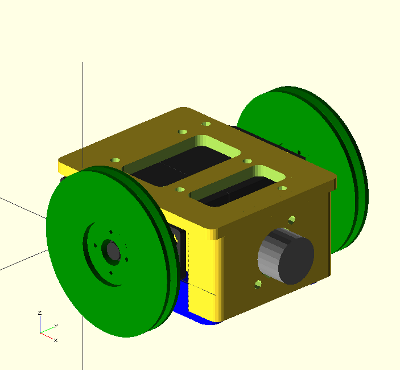 In the meanwhile, OpenScad is a great tool (and very extended) for developing mechanical parts. There are thousands of designs at thingiverse (tagged with the word “openscad”). Although it is rather easy to design with it, sometimes understanding how others have implemented their parts is a complex task. Even if the code is made by yourself, after some time, it is rather complicated to understand it. There are plenty of translate, rotate and other operators nested in deep blocks of code. Many times is easier to start from scratch than to re-use some code made by others. 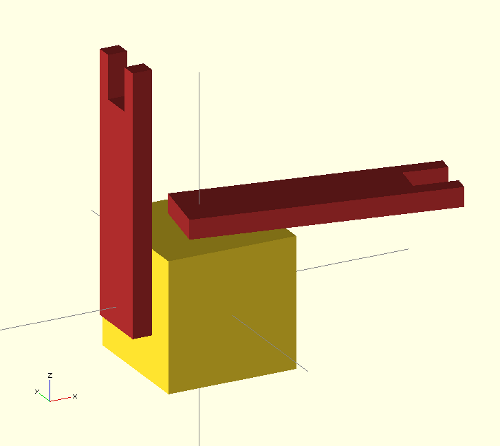 In order to make the code more readable and reusable, I am working on small tools for enhancing openscad designs. One of them is the vector library. Now I cannot live without it 🙂 The new tool I am presenting here is the attach library. When designing is rather common to design separated sub-parts as modules that are connected together later. 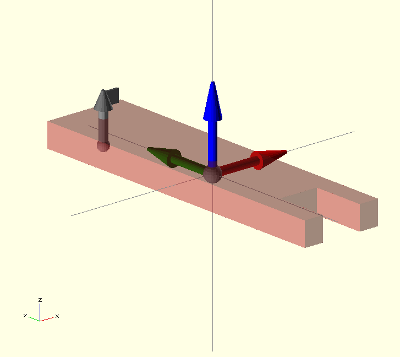 In complex multipart-objects, such as robots, it is also useful to connect all the parts to see how the final design looks. 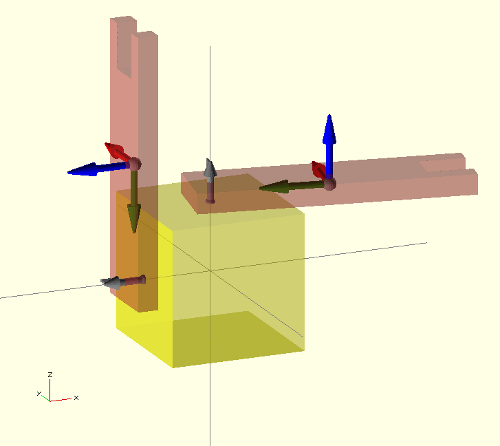 It is not difficult to do such operations in openscad by means of the translate and rotate operators… but it generates a very difficult to understand code. Here comes the attach operator in our help. In order to write re-usable and understandable code, we have to separated the part data from the code. The first give us the information of the part: size, drills … The second tell us how the object is built from the data (algorithms or approaches). One can choose different algorithms or approaches for building the object from the same data. Separating the data from code makes it possible for others to re-implement the algorithms, therefore improving the parts. One way of achieving it (for attaching parts) is using connectors, defined as a list of 3 elements: the attachment point, the attachment axis and the roll angle. 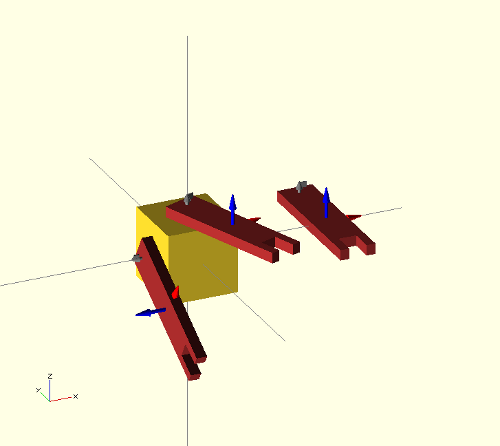 Now we can see the main part (a transparent cube) along with its frame of reference (module frame()) and the two connectors in gray. 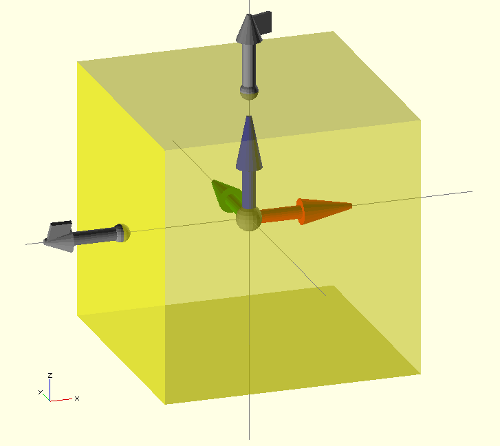 The graphical connectors represent their three components with different objects: a sphere on the base for the attachment point, a vector for the attachment axis, and a square mark on the vector head for the rolling angle. The meaning of the first sentence is pretty clear: Attach the connector a of the arm part to the connector c1 of the main part. where b is the connector of the new part. That is how the part looks once you turn off the debug flag. but …hey! It is opensource software! Yes! it is! So, if the attach operator is useful and the community start using it, it can be implemented natively as an openscad operator… or it can be implemented in higher level mechanical description languages, like ooml (which already include it). Previous Previous post: ¿¿Viagra en nuestra web?? Noooooooo!!!!!!! !